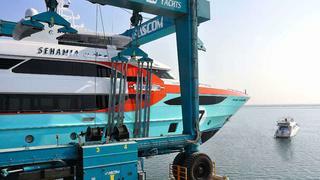 Gulf Craft has launched its latest Majesty 135 semi-custom superyacht, bearing the nameplate Sehamia. This is the UAE-based builder's third superyacht launch larger than 35m in less than nine months, following the launches of Majesty 135 hull No. 3 in January and the third Majesty 125 in February. The new launch is customised inside and out. She stands out from her predecessors featuring a striking, race car-inspired paint job with a sea foam-coloured hull and international orange on the superstructure lines. According to Gulf Craft, this is also the first Majesty 135 to include a garage aft to store diving and fishing equipment. The layout and interior appointments were also custom designed to meet the owner's request. Carried out by Gulf Craft's in-house team, the interior has been designed with materials include cherry, maple and oak burl wood matched with dark emperador marble, white onyx and azul bahia granite. The yacht features six staterooms including the upper-deck owner's stateroom. There are six crew cabins divided between crew quarters in the front and aft of the yacht.